Marcel went to visit Papa this evening. He left his slippers behind. 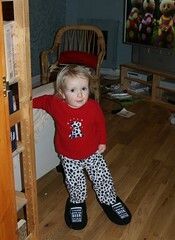 I think I might just steal his slippers - they are just the right size for me. We went to the Flicks !